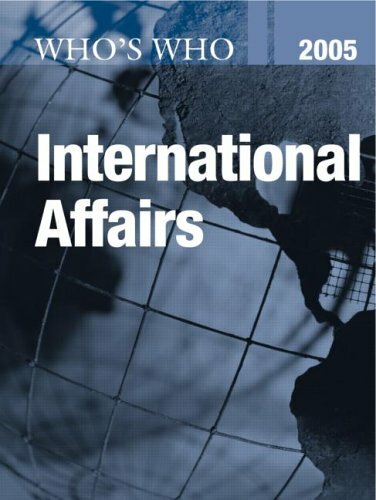 International Affairs: 9781857432725 Hardcover - LIMEROCK BOOKS INC. The 4th edition of this highly regarded title provides invaluable biographical details of the thousands of major figures involved in all aspects of international affairs. The Who's Who in International Affairs 2005 is truly international in coverage, and lists over 6,000 entrants from a wide range of disciplines, including leading diplomats, politicians, government ministers, heads of state, academics, civil servants, judges, think tank analysts and scholars, and heads of international organizations, Meticulously researched, this title will be of great value to anyone involved with international affairs world-wide. Entries are listed alphabetically by surname and, where available entries include: Name; Present Position, Nationality; Date of Birth; Family Details; Education; Career Information; Honours and Awards; Publications; Contact Address; Telephone and Fax Numbers; E-mail and Internet Addresses. A unique new appendix lists, for more than 170 countries, the names and contact information for all ambassadors to and from those countries. Callo was commissioned from the Yale University Naval Reserve Officers Training Corps. In his civilian career he is a free-lance writer who writes on military travel and business subjects, frequently focusing on Vice Admiral Lord Nelson.